Munruthel are a band from Ukraine that has been featured before in this zine with the musical style on this recording being dark ambient instead of the pagan/black metal that is found on the other releases and this is a review of their 1997 album "Yav, Nav i Prav" which was released by Gardirika Musikk. Drums when they are utilized are slow slow tribal beats, while the synths bring a very dark, atmospheric, ambient and dungeon sound to the music and they are the main instrument on this recording. Vocals when they are utilized range very distorted industrial style vocals and some clean singing which enhances the pagan elements of the recording as well as some samples in addition there is a brief use of spoken word parts, while the song themes cover Slavic Paganism and Nature, as for the production it has a very dark, raw and primitive sound to it with most of the songs being long and epic in length. 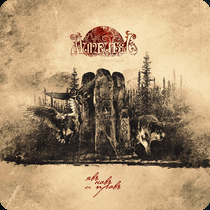 In my opinion this is another great sounding recording and if you are a fan of pagan/ dark ambient, you should check out this album. RECOMMENDED TRACKS INCLUDE "Father-Sun (Sunrise)" "Fern Flowering (Kupala-Night)" "Destroyed By The Gold Crosses" and "Initiation Of Spring". RECOMMENDED BUY.